In the ancestor shrines which many Taiwanese families maintain, those who’ve passed away are represented by names on elegant but austere tablets. In almost every folk temple, however, gods and goddesses take the form of colourfully-attired effigies. Some of these josses (a word derived from the Portuguese word for god, deus) are no larger than a doll. Others are a big as an adult human. The pantheon of Taoist, Buddhist and popular deities is so huge an accurate total is impossible. 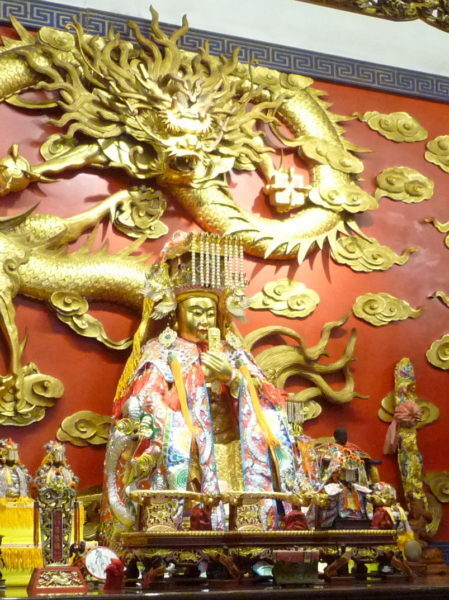 There are minor gods worshipped in one place only; and others, like Mazu (pictured upper left) or Guan Gong, revered by ethnic Chinese communities throughout the world. Mixed among them are historical figures who were deified after death, such as Koxinga. There are even a few divine personalities that take a non-human shape, such as Lord Tiger, a guardian spirit usually placed beneath another god’s altar. Beneath the robes and headgear, temple effigies are usually wooden, but some are made of clay or even metal. Some are carved from a single piece of wood, while others have arms and heads that can be moved or detached. Several are older than the temples in which they reside; a few, the pious claim, are over 1,000 years old, and were already ancient when they were carried to Taiwan by 17th-century pioneers. In most temples it’s impossible to get very close to the effigies, which can be frustrating for photography enthusiasts. Precious icons are kept behind steel bars or plastic screens. The bars prevent theft – precious idols have been stolen or kidnapped – while the screens keep them from getting sooty. It’s not unusual for a large temple to have more than 100 effigies representing a dozen different deities, spread among three, five or even more altars. As you’d expect, the main altar is dedicated to the temple’s principal deity, who in Taiwan is often Mazu. Incense plays a central role in Taiwanese popular religion, and the smell is omnipresent in halls of worship. In a religious sense, however, the scent is unimportant, as it’s the smoke curling upwards which is believed to convey prayers to heaven. A couple of Mandarin Chinese terms often heard in connection with temples underscore the importance of incense. One is fenxiang (‘dividing incense’), the name of the ritual by which followers of a god in one particular house of worship take ash of incense sacrificed there and use it to establish an affiliated shrine at another location. Enough should be collected to fill the main censer (pictured lower right). Pilgrims who travel away from home in order to pray and make offerings at a related temple are called xiangke (‘guests bearing incense’). Part Three of this article will introduce the non-incense offerings you’re likely to see in a Taiwanese temple, as well as the customs and conventions which surround every visit to a sacred building. If you’ve not already seen Part One, about exterior features of temples, do take a look right here.